awakencomics.com is a group of friends sharing our love for making comics that will surely awaken your creativity and imagination for free with updates evMonday & Thursday night. When a few friends get together and start making stories, sometimes magic happens. Aaron Bigelow here, creator, writer, and illustrator webcomic The Other World, Chuck Boris: Kung Fu Bear Fighter (that I do with my son Josh,) and Big Bounty. I’d like to have a word about what it is we are doing here at awakencomics.com. The ideas for some of the comics on this site came about many years ago, some as old as 25 years, but the idea to just publish ourselves has just been around for a couple of years. We are located in Aberdeen, South Dakota, not a very good place to hit conventions, although the climate is on the horizon for great things, mainly the closest stuff is hours away and that’s small stuff, and as we all have other full time jobs, we just decided that the Internet may just be the way to go to share our stories with the worlds comic adoring fans. Thanks for stopping by Awaken Comics and please join us on Mondays and Thursdays for fresh content! FOR MOST CURRENT STORY POSTS PLEASE SCROLL DOWN. ALL OF THE BOOKS ARE IN A ROW BELOW, FLIP THROUGH AND READ FREE! A rare Wednesday post, mainly because we are in the local newspaper today- shout out to Aberdeen American News, and Kelda Pharris for the awesome article. I thought I’d get in here and organize a little bit to let you know what is going on with us lately. First off if you like this site, please go to patreon.com and support Aaron Bigelow, the proceeds go to keeping this free, and allow me to do some art programs in mo local community, and keep those free as well. As for the comics we are making…we are currently in coloring mode for the first 22 pages of Exo-16 and The OtherWorld comics as the first chapter of each story is complete and we thought we would take a few weeks in between stories to add color to each chapter as we go, then the process won’t seem so daunting when we get all 5 or 6 chapters completed. Each colored section will go up in place of our regular new page read until the book is complete. In the meantime for fresh content make sure you follow along with Chuck Boris Kung Fu Bear Fighter, by father son team Aaron and Josh Bigelow, I’ll be dropping new pages weekly until that story is complete as well. Thanks for checking in and read all of the current work on our books below. Welcome! to anyone new, this is a rare post, we normally don’t do anything on Tuesdays, but today is special. My son and I put up a Patreon campaign to help raise money for Chuck Boris Kung Fu Bear Fighter. Below is the preview. There is a bunch more in the works that Josh and I are currently prepping. Please keep in touch on my social media to catch all of the updates! Thanks! It’s Monday again and that means more pages from The Other World! This week wraps up the first chapter of the story, I won’t spoil what happens, so we’ll talk more about it next week! We will be taking a few weeks off before the next story arc begins, but in the mean time you will notice that all of the artwork from the first chapters will be replaced in color- glorious magnificent color! So keep coming back and checking the updates as scheduled for updates! Thanks and see you next week- Big! 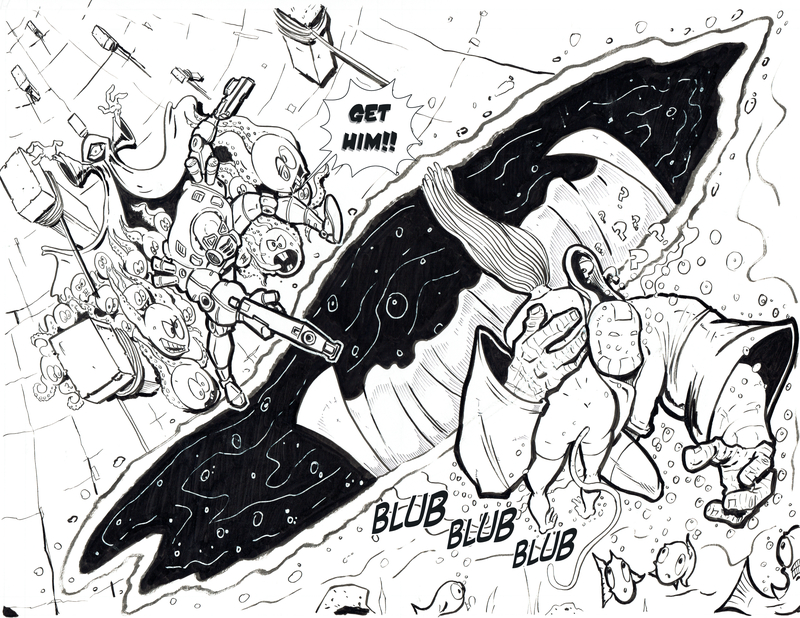 The OtherWorld page 22 and some extra doodlin’s! Hard to believe there’s only one more page of the first issue EXO-16’s first issue left! Two pages a week since the beginning of the year has really kept me busy while working full time and raising a family! I really hope everyone who has taken the time to keep coming back to read this book as well as, Big’s The Other World has enjoyed what they are seeing! After the last page is up, it’s time to begin the coloring of the first issue and begin to promote! So please share this with your friends and family and keep coming back to us here at awakencomics.com! Good Monday morning everyone! Here are the new pages for The Other World. I am really enjoying making this story, it has everything that I love. Action, adventure, comedy, sci-fi, fantasy, and I get to draw a really big strong hero and his opposites, so there is a lot of fun dynamic stuff for me to play off of. I hope everyone is enjoying this as much as I am, because there are 5 more chapters that will be around 22 pages each, and when I’m complete, I’d like to offer this to for sale as a graphic novel if we can figure out how to make it work. Thanks to everyone who keeps coming back and reading, we appreciate you so much! Enjoy the new pages and have a great start to your week! -BIG! I’ve update the cover a little, so here is the new version! Thought I’d put it loud and proud right at the top to start the colorful week! The Other World Pages 20 & 21- Just about done with the first Chapter! What an exciting feeling, come back next week to find out where this leads to! Hold onto your britches it’s Thursday and EXO-16 is ready for two new pages! After these two pages, there’s only 3 more to go before we wrap on issue 1! So stay tuned to see how everything turns out for Loudie and the gang! See you next Thursday! Exo-16’s two most current pages- by the amazing Alex Harper- For the rest of the story so far please scroll down to the book and read, updates every Thursday. Welcome back! It’s Monday and that means another two pages of The Other World! This issue is 22 pages so we are getting to the end of part one and the action keeps on going. Outside in the ancients training grounds, Ghritt tries to get Lhanna to safety and is on the run from Schrah and Travis who have orders to collect their weapons and destroy the four ancient warriors. The battle is just starting to get interesting, keep coming back every Monday to see where this is going! Thanks- BIG! 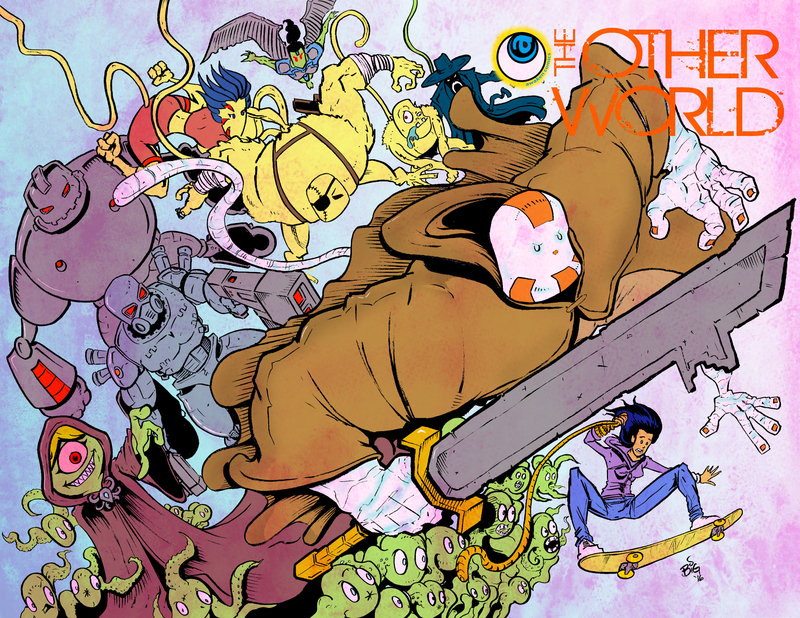 We are nearing the end of issue 1 of both EXO-16 and THE OTHER WORLD! With only 5 pages left in EXO, things are really starting to get weird… our poor gang of orphans are in quite the scary predicament and what happens next will change their lives forever! So keep coming back every Thursday to see how it all goes down! Things are getting serious and we are all finally going to find out if they are going to escape their watery grave! The Other World Pgs 16 &17 – Inside the caverns Pudabuga is about to open a portal to bring some very important people into his world to save them at a critical moment in their lives, and to help save his world. He is interrupted by Chaulin a bounty hunter sent to collect his War Hammer. Come back next Monday to see what happens next! Thanks- BIG! Welly welly well! 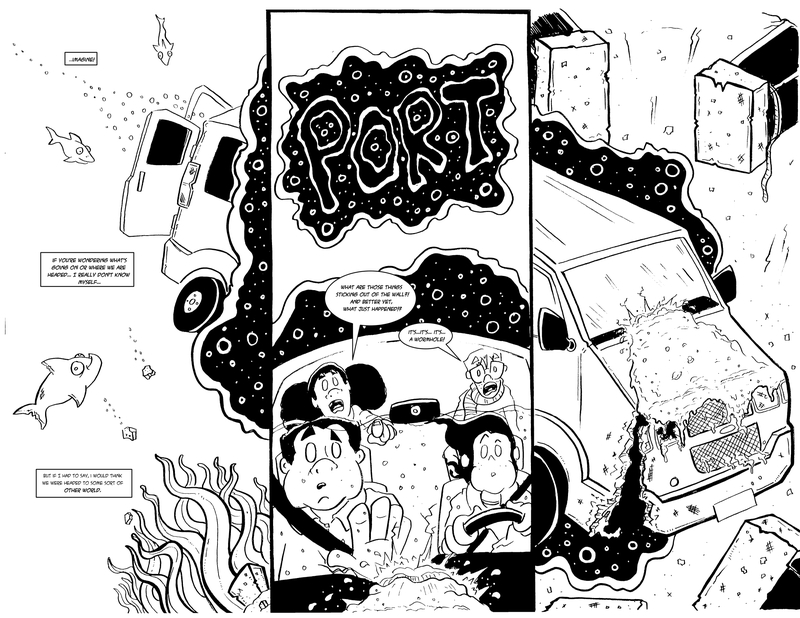 It’s Thursday and it’s time for two new pages! So even though my pages look pretty amazing, I really only have about 30 or a little more comic pages under my belt, so for me personally, this a big learning experience. I bring all this up because the two pages added tonight look incredible and I’m super proud to have fit so much into 17 panels on two pages, but… there is a mistake… 🙁 As I have been writing EXO-16 I have been doing two pages at a time and keeping them looking nice as a double page spread each time, so as I did these panels I didn’t think of how you, the reader would read them. They move from the left on the left hand page and read across all the way to the right, instead of reading it page by page! So with that being said, this is not the final version. As I wrap up the book and begin to color and get the book ready for print, I will rearrange the panels so that it makes sense! So bear with my mistake and please keep enjoying the story! Ladies and gentlemen, boys and girls–welcome back! It’s Monday again and that means new update time for The Other World! Aaron Bigelow here, writer and illustrator for my current project The Other World, a webcomic that asks the question, what if you had to help save another world, but it might mean leaving this one behind? It’s the right thing to do, but sometimes that isn’t always the easiest choice. Well, follow Holly, and her little brother Gener as they make those decisions when faced with that exact question! 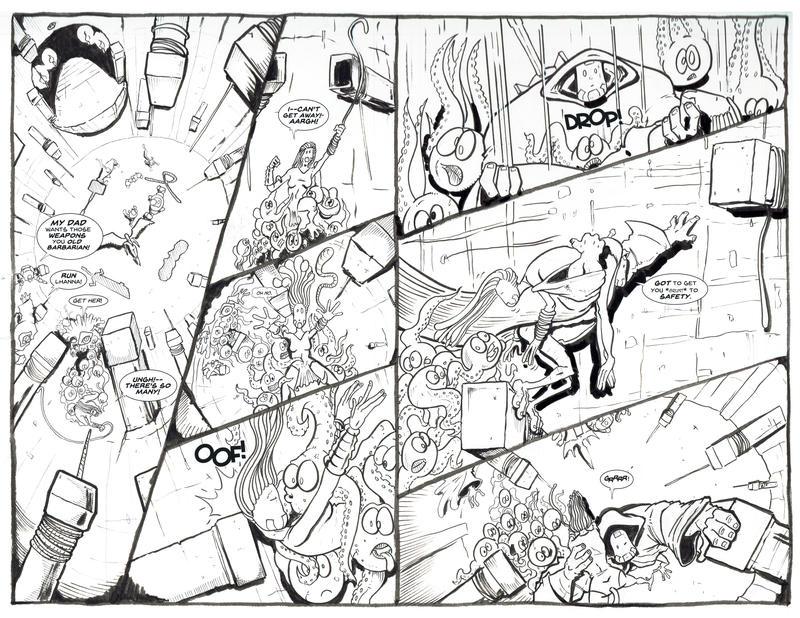 Here are the next two pages of The Other World, we are already up to pages 14 &15, can you believe it!? Enjoy the new pages, and as always, be back next Monday for the continuation of the story! –BIG. The Other World pgs 14 & 15. When we left off last Pudabuga was inside the temple starting to bring his much needed heroes over from Earth. This is what’s going on outside in the meantime with Ghritt, and Lhanna. Hope you enjoy the new pages! THURSDAY! THURSDAY!! THURSDAY!!! In case you didn’t already know, it’s Thursday and that mean two new pages of EXO-16 are up and ready for your enjoyment! This project has been a blast to work on already and really, we’ve only just begun! With every page our cast of kids get a little closer to crossing over into an alien world unlike anything they have ever seen before. I’m excited to dive in and start showing off this other world (plus I’m getting tired of drawing the darn van!) So please stay tuned and tell your friends that we are posting everything for you to read for free at this point in time! After all the pages are finished we will be getting ready to color and start pushing this comic for the masses (or at least a few of you!) to see! Welcome back to The Other World! When we left off last Pudabuga the mysterious ancient with the war hammer was retreating to the interior caverns of their temple to use the power of the magical war hammer to bring the heroes they need to Mcullo to help save their world. One of the villians hired to bring the ancients weapons back follows him into the temple figuring he will be easy prey. Be sure to check below and flip through the rest of the story if you need a refresher, or just want to check out the awesome art. The Other World will have alot going on through the next year and a half so please keep checking back every Monday to watch this story grow into it’s finished colored version! Thanks- BIG! The Other World Pages 12 &13. This looks like it could get bad for Pudabuga the Ancient with The War Hammer. Keep coming back every Monday for two more pages to see where this will go! Good golly miss molly, here we are already half way through the first issue of both EXO-16 and The Other World! This project is moving along quickly but there is still so much more story to tell and trust me, it is going to just keep getting better and better! In these two pages we get to meet Ms. Larvene Lump and the lovely Linn! One a girl the kids all really look up to and admire and the other… well the other is, well I’ll just let you read the pages and see what you think! Also, Awaken Comics (Bigs and myself) have been discussing the direction of this small friend owned company and project and big things for us are in the works and we are excited to share everything we can in the next several months! So remember to tell your friends about us before we EXPLODE into stardom! (or really just keep making awesome books for you to keep reading and enjoying!) Have a great week and I’ll see all of you back here next Thursday! Oh and please remember to stop by this page every Monday to check out Big’s weekly updates of the super excited companion book to EXO-16, THE OTHER WORLD! Aaron Bigelow here and welcome back for the latest update of The Other World. The story is moving along quickly and a lot is happening, by the end of this issue, in 11 more pages, everything will tie together and you will be able to see where this is going, we’re playing the long game here. As for the long game there are some cool action shots on this page spread and I look forward to the many more I get to bring you in the near future. If you are new to this story or just need a refresher from last week scroll directly below this image and flip through the book. Send us comments if you have questions or stories about your cats! Thanks-BIG! Good googily moogily it’s Thursday again and time for our weekly installment of EXO-16! When we last left off we saw our trio getting into some trouble at their school, Now this week why don’t we dive into the office and eavesdrop on just what is going to happen! I hope you are enjoying this story, for me it’s a blast to work on especially since my three young kids can be involved as I write and illustrate the pages! Well enough blabbering have a great week and I’ll see you next Thursday! OH WAIT!!! 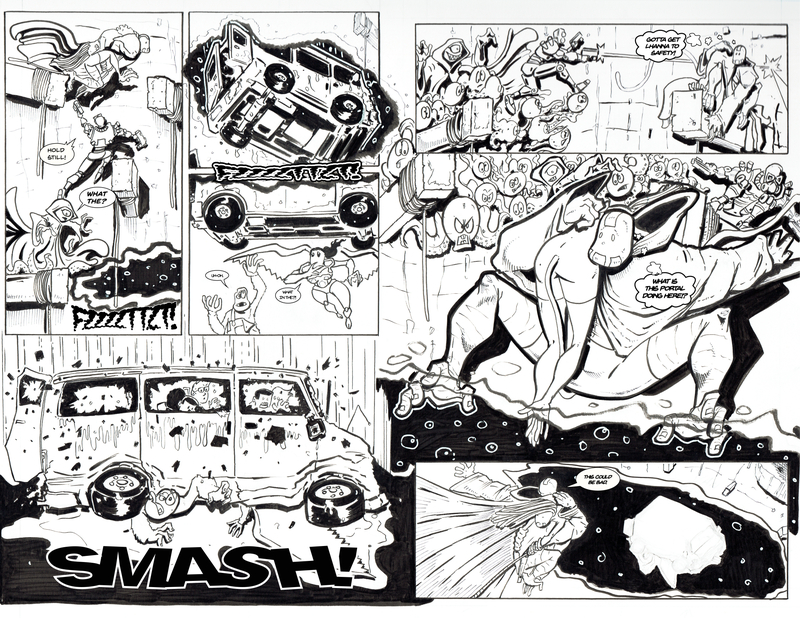 Big news, Awaken Comics (Bigs and myself) have been invited to hang some original pages in the gallery at the local theatre here in Aberdeen. The Capitol Theatre reached out to us and has offered to hang our stuff for more of the community to see and enjoy and hopefully bring in some new talent! Keep your eyes peeled as we will be posting pictures of our new adventure soon! Welcome back! This is the last January post for The Other World, it has been coming along nicely so far, hope everyone has been enjoying reading it as much as I have been making it. We are coming to a point in the story where all of the main players have almost been introduced, so it’s a good point to jump into the story. Here are the most current two pages, to read the rest, the book is located directly below to flip through- I suggest new readers start there. 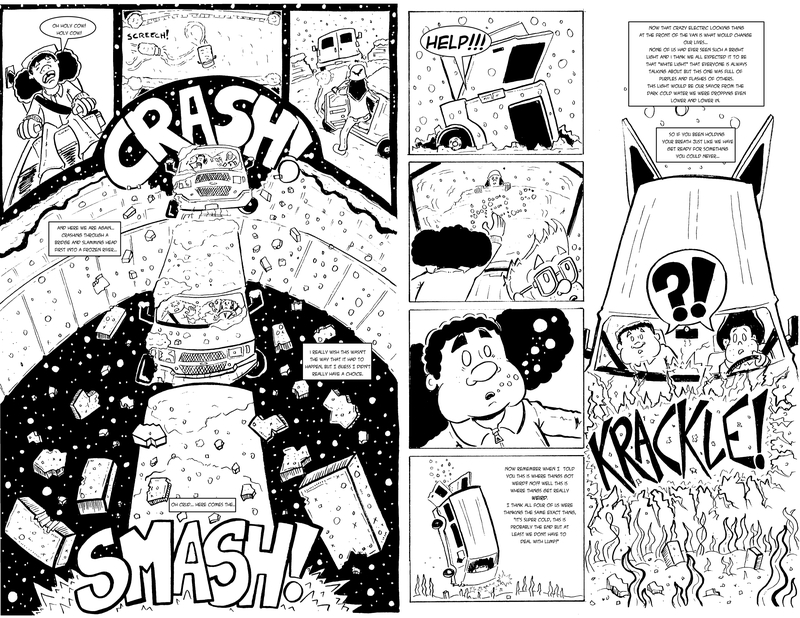 In these two pages Holly and her little brother Gene are witnessing the van in front of them going over a snowy bridge in nasty weather. What would you do? Follow along and find out how Holly and Gene react to the chaos. Thanks and see you next Monday! Don’t forget to stop back Thursday to follow Alex Harper’s Exo-16. -BIG! Oh- side note, Chuck Boris Kung Fu Bear Fighter part one is beginning below. Follow along with this story Created by 13 year old Josh Bigelow and written and illustrated by Josh and Aaron as a fun family project. Updates will be posted when Josh isn’t busy with his homework. -BIG! Well good golly miss molly it’s friday and I completely missed updating yesterday… DRATS! Well anyways I am debuting a new cover (which is only in black and white and is nearly finished being colored, but I still wanted to share it) and two new pages finally getting to how our main characters got into such a scary situation. Also, I have compiled all of my pages of EXO-16 into a single book so you can take the time to flip through and enjoy! Have a great weekend! Happy Tuesday! Sorry for the late post, I’ve been getting over the flu, so I’m a bit behind and haven’t been hitting the social media either. I’m still a little under the weather but wanted to post my pages quick so I wasn’t too far behind for the people who still like to read comics! Here are the latest 2 pages, and as always you can flip through the whole book to keep up with The Other World. Thanks- BIG! Holy Moley it seems like just last week we were introducing our new on going web comics EXO-16 and The Other World… oh wait, that was last week! Well here we are again and this time it’s two page spread continuing the suspense of were we last left our crew flying through a bridge and towards an icy river! Like Aaron said earlier this week, as we get a few more pages up on the website we will be compiling them into a book form, so keep your eyes posted for these two amazing web comics every Monday and Thursday, and as always stay classy Awaken readers! Below are the first few pages of The Other World, join us every Monday as I post a 2 page spread and move this graphic novel in the making a little progress every week. Enjoy the 2 new pages where we are continuing the introduction of the main cast. As I produce a couple more pages I will format this into a book style format like we have throughout the rest of the website. Hope you enjoy the work so far. Have a great week! Writer, Illustrator, Co-creator of The Other World. Happy New Year from Awaken Comics! To start 2017 off right we are starting The Other World and Exo-16 this week, so you can follow along with the stories from the beginning. Both comics look great and are in full swing production so keep coming back Mondays for The Other World, and Thursdays for Exo-16! All of that holiday chit chat aside, below is the cover and first page of The Other World the new web-comic by Aaron Bigelow, here to read for free with a little more added every Monday. Follow along for free, tell your friends and comment if you have something to say about it, we’d love to hear it. Happy first Thursday of 2017 and the start of so many more amazing thursdays to come! It’s a big week for us here at Awaken Comics, with the release of three different web-comics Monday was the release of The Other World and Chuck Boris both coming from creator Aaron Bigelow with help from his son Josh and today marks the start of EXO-16 by me, Alex Harper! All comics are free to read and are updated every Monday and Thursday, but I know you’ve read all that before so please scroll down and enjoy the new cover and the first page of EXO-16 issue 1! 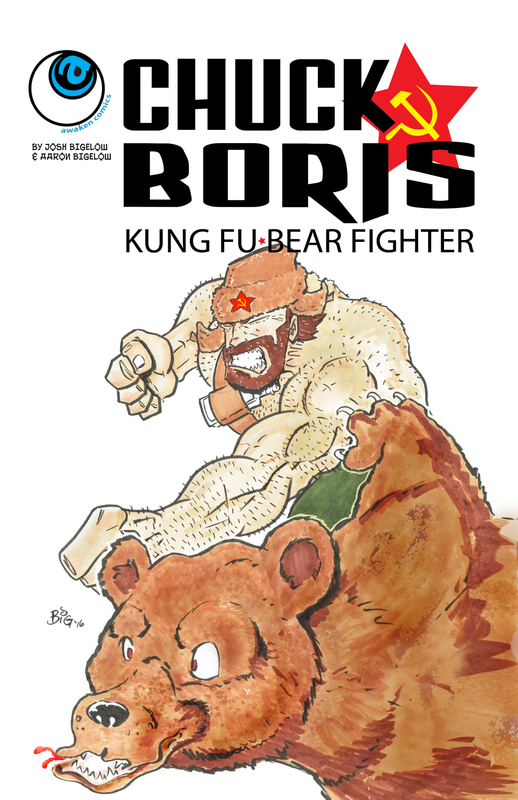 Here is something that you can look forward to in the future, our new web-comic Chuck Boris: Kung Fu Bear Fighter created by Josh Bigelow and Written and Illustrated by Josh Bigelow and Aaron Bigelow. We’ll be posting this as we have time to make it as Josh is 14 years old and has homework to do. We’ll post on our social media when we have time to update Chuck Boris so you can find the new pages, or just keep checking back here at awakencomics.com! December is always a whirlwind, and before I know it…it’s over. Aaron Bigelow here writer, illustrator, and publisher at awaken talking about what’s to come for awakencomics.com, we didn’t post much throughout this month as we prepare for the New Year and the new comics we will be working on over the course of the next couple of years. We have already been talking about the two new projects that Alex and I will be working on (Exo-16 for Alex and The Other World for myself) and have each done short stories for each so we can play around with what these worlds may feel like. As of January 1st we will be posting pages on Mondays and Thursdays so we can keep everyone’s addiction to comics fed until we finish the stories and get them ready to do graphic novels with. So if you want to watch a new story grow a little at a time and sprout into a graphic novel at the end, you are in the right place. I hope you can find something that you enjoy, or something that your kids might like, these new stories are safe for any audience, so give them a shot…just don’t let the kids read Big Bounty. Hope to see you back January 1st for The Other Worlds first post. See you here- Big! Well hot dang it’s Thursday again and that means us here at awakencomics.com are updating EXO-16 for you fellow webcomic lovers to follow along with! Today will feature pages 3 and 4 to help continue the first action pack and sneak peak of our main character Loudie! Remember Monday’s will be spotlighting our other web-comic from Aaron Bigelow called The Other World, Scroll down to read for free both comics are family friendly and always free to read here at awakencomics.com So keep checking back a few times a week to see all of the new content we post for your peepers to enjoy! Happy Thanksgiving to all of you Awaken Comics lovers and since it’s Thursday that means it’s time for the first pages of EXO-16 (Issue #0) to be shown to the world (SCROLL DOWN TO READ FOR FREE)! 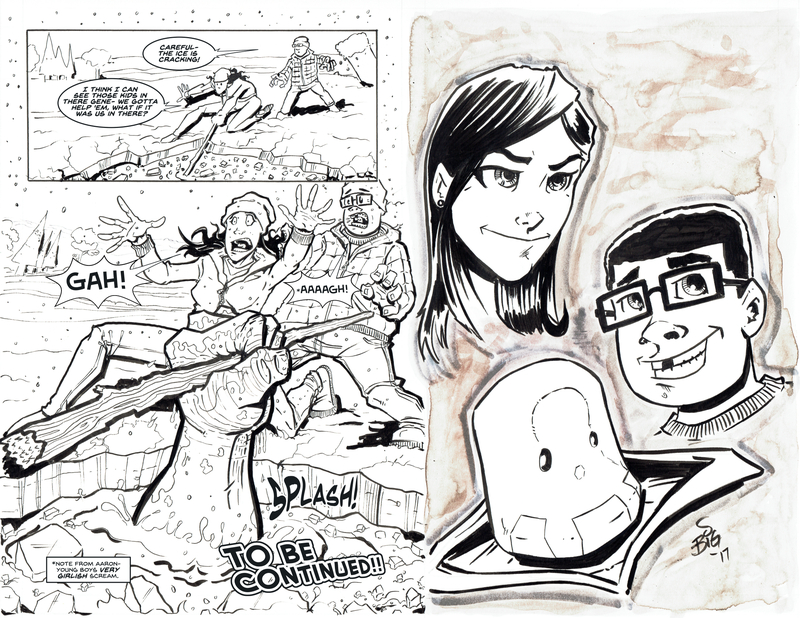 Awaken is very excited to begin this epic journey of two separate comics that will come together in the end to wrap up an amazing story that the whole family will surely love! Plus make sure to stop by every Monday and get your weekly dose of The Other World! Wishing you a Happy Turkey Day from Alex here at Awaken Comics! Hello there fans and seekers of something new and original. Aaron here, welcome to the first comics post for The Other World, (SCROLL DOWN TO READ FOR FREE) a weekly released web-comic to follow along with for free, and share your thoughts and ideas while I post as much stuff as I possibly can in my free time to keep everyone interested. There are links to Awaken Comics social media streams at the top of the page, so please feel free to follow us there as well, where we may post more works in progress type stuff. I know Alex is planning on releasing his new story Exo-16 on Thursdays, so look for an update to be coming soon. Thanks to everyone who is taking the time to check the comics out, hope to hear your thoughts. See you here again next Monday. Over and Out. With the completion of our two most recent stories from the Big Bounty, the Naked Ninja, and Bob Johnson & the Double Whammy we are ready to switch gears into the next big projects here at Awaken. Currently we are excited to be bringing two new stories that will both work together or separately to tell the tale of an amazing world that needs a little help. EXO-16 and The Other World are new comics that the whole family will be able to enjoy and share with friends. Starting 11/14 we will be releasing short stories for both titles where we will be putting a new page up Monday for The Other World by Aaron Bigelow and Thursdays for EXO-16 by Alex Harper. 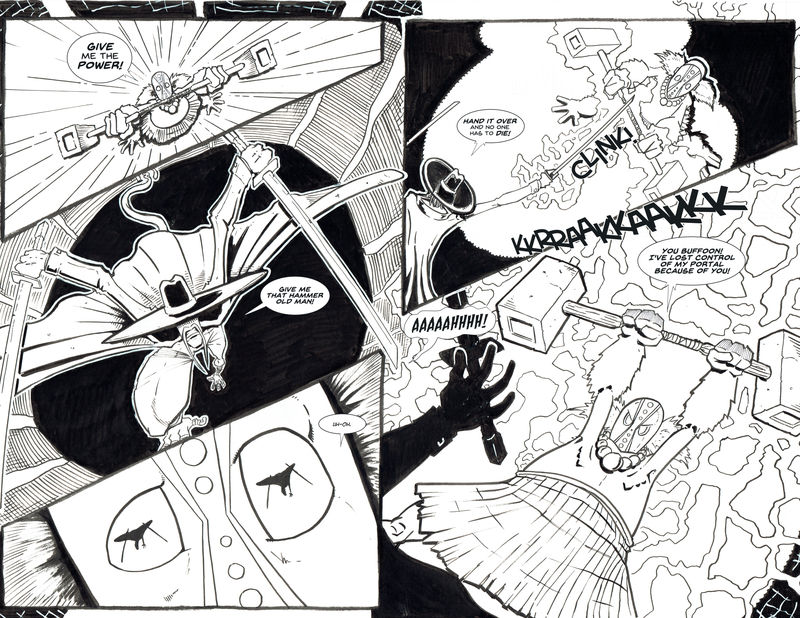 What started with just EXO-16 as a project for both artists co-wrote and do art together with Aaron penciling and Alex inking turned into two projects done by each artist separately where they both co-wrote the stories together and Alex took over the art chores for EXO-16 and Aaron does The Other World. The first two stories will be a taste of what’s to come when both series begin their own graphic novel which we will post completely free to read during its creation. To make things even better we will share the production of the book along with our creative process so you can see how we do it as we go. So join us, every week STARTING 11/14/16 to see the conception and creation of these two amazing stories! Read Stories for free…seriously, we just love sharing. This is the latest Big Bounty, entitled Bob Johnson & the Double Whammy. Who do you call when you need a U.S. Senator and a Narc in a Police Station killed all in one night? Big Bounty that’s who, and just to make sure they don’t go to Federal Prison, they’re going to contract it out to the most average man you’ve never noticed: Bob Johnson. See the bullets fly from his Briefcase Machine Gun! MATURE READERS ONLY! MATURE READERS ONLY! MATURE READERS ONLY! Okay, that’s once, twice, three times a warnin’, don’t message us if you see something you can’t unsee.